When it comes to cooking and baking, I believe in shortcuts. I'm no domestic goddess, that's for sure. I've done a lot of baking in the past but egads, all the washing up later kills me. These days, I cheat. I've been buying these frozen Waitrose french butter pastries for a while now. Just shove a few into the oven when friends come a calling and serve the croissants while they're still warm and crispy. There's nothing more pleasant than the sweet scent of pastry wafting through the flat to greet them as they walk in. I'm usually not a fan of cheddar but I am now after stumbling upon a brand that I've never heard before - Fivemiletown creamery. Interesting name but the cheddar was beyond delicious. It certainly beats eating out and easier on the pocket too. Mmm. Lovely. We had those croissants for Christmas day ... and the Danish's as well. A change from the usual smoked salmon and scrambled eggs for us. I'm not a great cheese fan but the hubs just stumbled across a new cheese called Black Bob - described as extra mature creamy cheddar and it was surprisingly nice. And then I realised it tasted just like a grown up version of Dairy Lea - which put everyone off :o( Hope you had a lovely Christmas and New Year! what?! You have smoked salmon and scrambled eggs regularly? That's posh. I'll make sure I order smoked salmon next time. speaking of which....I need to cut down on my carbs too. Never heard of that cheese either but I don't go to Waitrose much as there isn't one near me. I quite often by their Wensleydale if I am in there. I really like the Glastonbury cheddar that is sold at quite a few farmers markets round London, they do lots of different types and let you try before you buy. 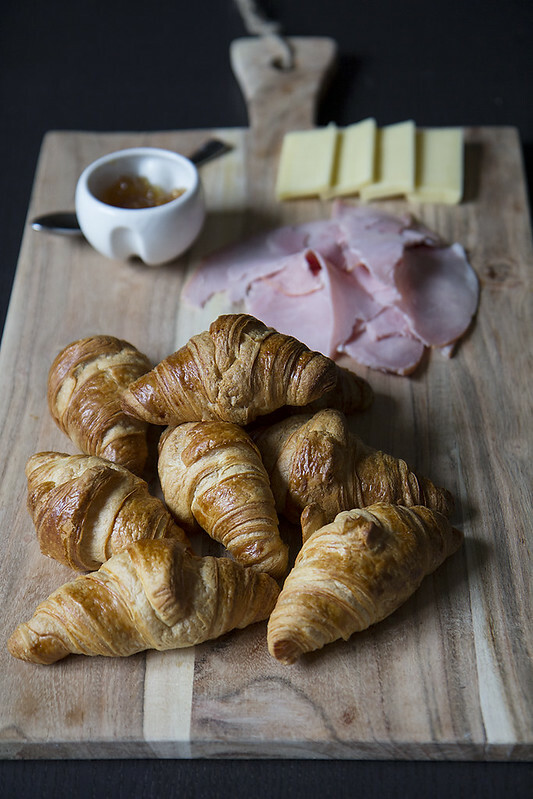 The croissants, cheese and ham look like something called a 'German' breakfast served at one of the local coffee shops near me. I quite often take a croissant at home, slice and put ham and cheese on and melt under the grill. I'll have to look out for Glastonbury cheddar. I only order online. Every time I walk into a supermarket, I walk out with things that aren't on my list. It's Greens of Glastonbury. They have a website but the ordering part doesn't seem to be working. I like their mature cheddars, but not all mature cheddars. They also have a mild one. Oh wow! Thank you for the info, Nicola. I didn't know that. I thought fivemiletown was a made up name!! Ok, this is so weird. Now, there's 2 people who live within a short driving distance from the creamery. Happy new year to you and Patrick! I had no idea your niece is living with you now. Much as it makes me scream at times but the children's chatters and cute antics never fail to put a smile on my face. I'm sure it's the same for you. OMG - It's from here! Another reason why you guys need to come visit. It's about an hour from Belfast and when you're going from Belfast to Enniskillen people always talk about driving through Augher (pronounced Ocker), Clougher (pronounced Clocker), Fivemiletown (say it fast - it's quite poetic!!) We're a bit weird here in Norn Iron...haha!